To email a workout to one or more swimmers, follow these steps. In the side menu click Coaching Tools > Workouts. Select one or more workouts. Click Actions > Send Workout. Click in the To field to select who receives the workout(s). + Choose Swimmers lets you then select one or more individual swimmers. Click a Roster or Location to send the workout(s) to everyone in that group or location. You may continue selecting swimmers and groups. Click (edit) in the Subject to change the default subject line. Enter a Message if desired. 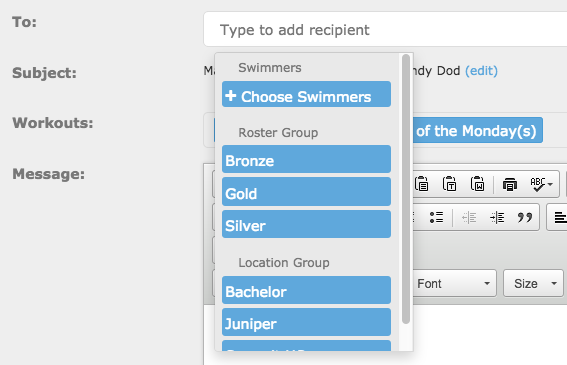 Click Send and it will email PDFs of the workout(s) to the selected swimmer(s)/group(s) and CC their Accounts. There are two ways to select workouts to send. Tap Menu > Coaching Tools > Workouts, select one or more workouts, tap SEND. Tap Menu > Coaching Tools > Practice Calendar, tap a practice, tap email icon in a workout. If you are sending workouts from the Workouts screen, tap the SORT dropdown if you want to select by Roster Group or Location. 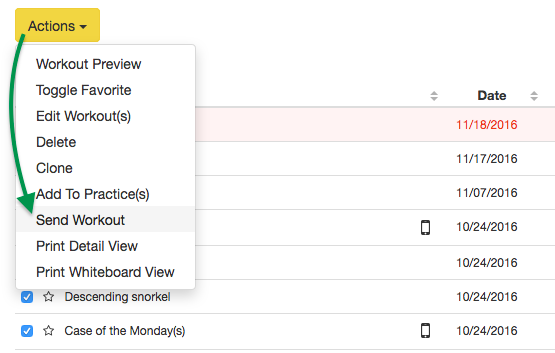 If you are sending a workout from within a practice, select from Practice Swimmers, swimmers assigned to the workout, Absent Swimmers, or Select Swimmers. If needed, select the desired swimmer(s) and tap DONE. Tap SEND and it will email PDFs of the workout(s) to the selected swimmer(s)/group(s) and CC their Accounts.